to, use in vitro Fertilisation (IVF) techniques. Seamless internal chamber with rounded corners Occupying only 31 x 28cm of bench space, MicroGalaxy has been designed to enable it to be used within IVF work stations and laminar flow cabinets. 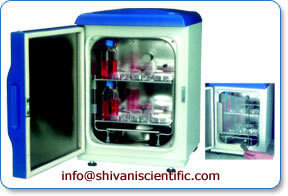 'Personal' incubator for cultivation of sensitive samples As with all Galaxy incubators, the advanced design of the MicroGalaxy eliminates the requirement for a chamber fan. Air flow onto a fan makes it and the area around it a potential site for the build up of contamination which is then spread around by the comparatively brisk air movement. High humidity with completely dry wall chamber The gentle air movement in the MicroGalaxy is by convection only, reducing the risk of spreading any contamination. Simple, easily removable shelf and racking system for easier cleaning A fan and air ducting can be both difficult to remove and clean effectively, the MicroGalaxy solves this problem. The need for HEPA filtration within the chamber is eliminated as well as vibrations which may adversely affect certain cell lines. Compact design and stackability optimise laboratory space The removable stainless steel humidity tray creates high and uniform relative humidity, which together with the gentle air movement, reduces sample desiccation to a minimum. Infrared CO, sensor for fast and accurate CO, recovery The unique six-sided heating system ensures that chamber walls remain completely dry reducing still further any risk of contamination.